The Atreides detected some Tleilaxu's Carryalls going near a Sietch Fremen. They are planning to convert those powerfull warriors into Gholas. The Duke want to stop that plan at all cost. Once the defend its successful, the Fremen will work together with the Atreides as a new unstoppable alliance. There are other alliances on Arrakis, but only one side can win the war. Can the Atreides-Fremen alliance overcome their enemies? For this campaign I forced myself to give the player at least 1 active ally to help in the missions. This means that your partner always will build/train units to attack the enemy. This will apply for all the missions during the whole campaign. The Fremen, although they can't train soldiers naturally, they still will have a base with a refinery, harversters and spawning some Fremens from time to time (if they lost one of the core buildings no more units will be spawned). Unlike other of my campaigns, this time it is sure that the player will always have someone on his side. Maybe the alliance doesn't become active until the player do something at the beginning but at least your ally will move, build and help to fight the enemy (no inactive or "just for show" type of AI). Tibed wasn't used for this campaign. You can expect some spawning fremen for "nowhere" to look like they are being trained. However loosing the Sietch or the way to win more money won't be more help to the player (it's going to be some reminders on the firsts missions). One way or another, your ally it's guarantee to increase his army and attack the enemy. Sometimes helping your ally it's needed, but for the most part you ally can do well by himself (depending of the chaos of the battle, this may change). The zip includes the files with the missions, the screenshots and some core files (not needed if you already have them). Not extra files are added, so the Fremen still can't be trained. It's ok. Play when both of you have time. By the way, I reuploaded the campaign. In the last mission I forgot to remove a screen timer (for tests purposes). Have no use in the actual game (nothing happens when the timer reachs zero). Redownload again, ignore the timer or change it manually with the editor to -1. I only needed to replay mission 3 because of fail and mission 9 because recording didn't start, so don't expect optimal way to win. It's better to combine your units with the Fremen. For example, if you see troopers just retreat and let the fremen to kill them, and if grenadiers appears send your vehicles and left the foot units behind and etc. I hope next missions are more easy for you :P.
The mission 2 and 3 easy/normal. Harder the mission 3. I did not expect from Fremen to attack me. Mission 4 is not hard, but it was not easy either. The mission 5 was a bit hard. But everything was successful. I was surprised that mission 6 was very easy. Harkonnen had a lot of units to defend yourself. The file in the first post it's updated. -I fixed a couple of wrong/missing words in some briefings. -Mission 1 was a bit hard for a first level type of map, so now the player (and your ally) receive a few extra infantry/troopers plus a couple of Tleilaxu vehicles and soldiers have been removed from some enemy attacks. -In mission 2 the Tleilaxu no longer receive more grenadiers if the barraks is destroyed (make more sense). Good to know. In Mission 6 the Harkonnen are fighting because they want, so we can assume they are strong enough to not be defeated easily. The player it's the one that can be destroyed if the enemy attacks caught you off guard. Also since the AI attacks are random, the difficulty of the map may change for play to play. Sometimes both mercs and Ordos attacked me at the same time, making it hard to protect for such a big force, but when the Harkonnen attacks and reduce the Ordo's numbers, then the player have more room to build stuff calmy without being harassed too much. Why do you nerf missions that are already very easy? Last time I played mission 1 the player had in the first reinforcement 2 Quads and 2 Trikes (and other infantry/troopers). I removed 1 of each vehicle but also I made the Fremen to spawn less units. Here was when I upload the file to this forum. Now, 20 days later, replaying the map (with those less units) I found that I barely survive (2 units alive).Figthing the grenadiers can be a lottery: sometimes the grenades kill severa units fast, othertimes they attack the light vehicle so don't do any damage (same happens with your ally, sometimes they attack directly, but sometimes they are moving instead attacking, and died because of it). About the enemy reinforcements, I removed like 1 trike (in a wave of 5 trikes), 1 quad (similar case) and 1 grenadier or so. It's not a big difference. This is the reason to give the player a few foot soldiers (which can died quickly anyway). I just think that a first mission/prologue sould give to new players more room to do mistakes and learning about the Tleilaxu-grenadier stuff. The mission 2 stuff it's just because the carryall dropping grenadiers (in his own base) it's just to simulate that the Tleilaxu are training grenadiers like any other units (they are dropped in "free" mode, not to hunt the player). No barracks = no more training; that simple. Keep in mind several factors: I play like if I don't know the mission, so I don't react until they shoot first (unit, building, harverster...) even if I know when and where will happen (initial enemy drops). I do not place a unit to be chased by the enemy drop so my other units kill them before they change the target. I play with the original dune 2000 resolution (640x400). Finally, I kill any infantry/trooper by shooting, never by crushing them with tanks (except by accident). This is the way I am sure that if I can beat a map playing like that, anyone can. I finally got around to checking this one out. Played through all levels on normal difficulty at fastest speed. Here's what I found! Very solid difficulty for a first map. I explored around just fine, enough units to comfortably pull ahead, and the map looks nice. I'd add a separate Carryall or two when you send a lot of reinforcements for the player, but that's an aesthetic complaint, really. I wish the island we started on was a little bigger, but the economy was fine. This match was finished in just under ten minutes. Repair Pads and Combat Tanks made it a cinch, but it wasn't too easy with the Tleilaxu Grenadiers showing up really often. Do they receive reinforcement Grenadiers often? The engagement lasted about fifteen minutes. I have a few complaints about this one. Carryalls are sorely needed on this map. I found it difficult to comfortably maintain my economy. I don't mind needing to defend my Harvesters as long as they can go to and from the Spice fields quickly enough. MAP02 was really comfortable, I was able to pump out Combat Tanks at a reasonable pace without running out of Spice for an extended period of time until the end of the match. On the plus side, you spread the Refineries and Silos out, making it easier to capture enemy resources, so thank you for that! I liked the Ordos base layout, it was nice. I also like the amount of context delivered in the briefing for this mission. The Ordos attacked a little too heavily and a little too often. I had no trouble holding them off, but I couldn't attack comfortably either. And when I did attack with a modest force, I was pushed back pretty quickly by reinforcements. Could you reduce the amount of reinforcements they receive, and make it so they don't receive reinforcements too late into the map? One last complaint: The cliffs around the Atreides' guarded Spice field juts a little too far into the base. If you could nudge the top right corner of that cliff formation over, it'd help units navigate to defend. My natural inclination based on the terrain was to move out to the south, but they kept attacking from the north, and that area's a tad small. The twist was fun. I like that the smugglers became our ally as the Fremen became our enemy. They both went for the Ordos at that point, making the map progress pretty smoothly from there, but I think perhaps that twist could come a little sooner. I hope to find out more about what that was about on the next map. This map was over in about 20 minutes. The minute you give at the start to prep us for the Ordos attack is appreciated. I was able to position my Missile Tanks behind the smugglers' walls. The initial forces we start with are also quite sufficient to last through initial enemy attacks up until we can build our own attacking forces, but... I think that's a problem. And it goes hand-in-hand with the economy issues on this map: The starting credits are quite generous, and I'm happy about that, but getting the economy up and running is difficult because there's no land near Spice fields (except for the tiny islands surrounding the starting position which could house a couple of Refineries, but you'd need to bring your MCV there, and that would be inconvenient because you'd need to build around the large cliff wall in your base to access most of the area). The Carryalls helped a LOT with getting everything up and running and I teched into them as quickly as possible since I noticed the Spice fields are so far away, so thank you for that starting Outpost. I had to focus all my resources into resource-gathering operations to get things started, and I'd much rather split resources between unit production and resource gathering. It took a while to gather a sufficient force to attack the Harkonnen, only to find that the units they were sending my way were reinforcements and they still had a ton of defenders in their base... and the smugglers weren't very helpful with distracting them. The small pathway closest to your position isn't very helpful, either. I was ready to attack, like, three times, only to find a couple of reinforcement drops back in my base! I get that the map encourages the Harkonnen to attack from up top, but I'd settle for a small expansion in the southeast corner of the area around the player's base rather than reinforcements dropping so uncomfortably close. I eventually attacked around the main entrance and captured their Heavy Factory and Repair Pad, bunkered up with Turrets and started pumping out Combat Tanks from their Heavy Factory, and that's when the Imperials turned on the Harkonnen. 1. I'd move the Spice fields closer to the player and maybe reduce starting credits. Alternatively, reduce the size of the initial starting position to a small island with just the Outpost and two Wind Traps, and then increase the size of the islands surrounding the Atreides base so that the player could move out and expand to one of them, closer to all that Spice. 2. Remove some walls and two Medium Gun Turrets in the Harkonnen base, particularly at their main entrance. Just a couple of turrets out front would be nice, and the one turret surrounded by walls on the border of their back-door could have a couple of wall segments removed. 3. Swap many Harkonnen reinforcements for, simply, a small expansion southeast of the Atreides starting position. The Imperials attacked at a fine rate and I enjoyed fending them off, but the Harkonnen made me REE after a little while. Their base layout was nice though, and I especially liked the back entrance and the wide open area north of it where I could gather units. Pretty fun overall, just could use some adjustment I think. This one was over in about twenty-two minutes. I really like this map! The map structure and reveal-map triggers during the first segment proved perfect. Very nicely designed. Not too many Harkonnen in the way, enough to feel like you're pushing through stuff. And all with just a few light vehicles! After the Fremen cleared out that area to the north, getting the economy up and going and pumping out units was balanced very well. I was able to do both at a very leisurely pace, and move out of my base at a comfortable time. The small expansion with a few turrets and a Barracks I took with just six Troopers, one Engineer, and five Light Infantry, which was nice to see. I didn't want to see huge amounts of resistance like on the last map. The map was nice and open so attacking through the Harkonnen base felt great. The base layout is nice, too. The only complaint I have is that there appears to be some kind of glitch. On my first attempt, the Imperials surprised me with WAY too many units. The natural map progression led me out to the east, and I attacked with small amounts of units, so because I was spread thin and all over the map, those Fremen and Sardaukar tore all my bases to shreds in minutes, despite having been massing units at the main base. I had no time to prepare a defense at all. This appears to be unintended because the second time around, I took out two waves of reinforcements and instantly won... there weren't NEARLY as many enemies as the first wave. I think you should keep a large initial assault, but give some smaller waves after that for a few. Otherwise, that ambush demands pre-knowledge, and that's quite unfair. I'm not looking at any of the triggers, so I really don't know how the end of the map worked. Hope this test helps you! This map was annoying. In part because the damn worm ate a couple of my Harvesters and hung around my side of the map, like, the whole time... but that was RNG. There's other stuff too. The mercenary and Ordos base layouts were fine, but the constant reinforcements they kept getting through the Starport was way too much. I kind of had to turtle up because if I went after the mercenaries and dealt a death blow, the Ordos would come down with a crapton of units and blow right through whatever defense forces I had left behind. The Ordos not only receive reinforcements, but they buy their own too. I noticed the mercenaries only have scripted deliveries, so I guess that's fine. The one-time Ordos reinforcements from south and west of the Atreides base is nice. It's a lot better when that attack doesn't happen three more times after the first. The Atreides starting units and reinforcements were nice too. My suggestions are: Adjust the AI's manually-built unit composition, remove a lot of those reinforcements, and increase the build rate and the map will be way fairer. I really liked this map! It took about 30 minutes to complete. Although the Spice layout made a lot of my Harvesters go right into a Fremen base and a Spice Bloom later exploded on a bunch of my infantry. It was the one southeast of the Atreides Construction Yard. I naturally wanted to put my Harvesters in the little nook to the southwest of the Atreides ConYard until I had Carryalls to ferry between the east fields, so... maybe if you moved the ConYard to the east and encouraged us to make use of the larger Spice fields, the Harvester pathing won't be trouble. The Fremen vehicle and infantry attacks were fun to fend off and the Imperials put up a fine fight on their own. For some reason, I didn't expect the Harkonnen to turn on me this map, but I'm glad they didn't. I miss Repair Pads, but the map went perfectly fine without one. I guess I don't have too much to say about this map. Spice flow was a-okay, light and heavy vehicles did the job, Fremen Warriors and Sardaukar reinforcements were challenging enough and the map didn't overstay its welcome. Good map! There are two "buts" in a row in the briefing text. This was a fun final map! I finished it in about 30 minutes. The reinforcements we received made up for the masses of reinforcements the enemy received. Economy got started and kept going very nicely. Starting unit composition was great; I positioned the Sonic Tanks near the Harkonnen turrets and scouted around with the light vehicles. I just have a couple of complaints: The area leading into enemy territory was quite small. There was only one way in! This meant that not only did the map progress in a linear fashion and require we head through the first Imperial base, but ALL the enemy reinforcements were piling through that one location, making it pretty difficult to get through that point. I'd love to see more action on the east side of the map with the Tleilaxu under attack. I also think there were too few Fremen around. I think we could see some more of the Fremen and maybe a little less enemy reinforcements in general, or at least we could see those enemy reinforcements spread around the map some more. If you opened up a cliff somewhere else, I think it would help make the map even more fun. Aside from a couple of hiccups, this was a solid campaign and really enjoyable! The twists and story were exciting, the premise interesting, gameplay fun. Thanks for making it, Cm! Lemme know if my suggestions wind up being helpful. Grenadiers showing up really often. Do they receive reinforcement Grenadiers often? When you reach a certain spot some units are given to the AI in attack mode. I know people like you can win early, so I was trying to push the player back a bit until the stuff happen later. Buy overall 2 refs in the left area and 2 on the south should be enough to harverst a good amount of money. The enemy sometimes send units from the bot side too, sometimes depends of the position of the buildings. Another thing, for example I saw multiple times the Ordos sending the infantry-troopers against the Fremen too. Maybe top it's not too wide, but you can make a bottle neck much easily. 7-8 units in a column and you may see the Ordos splitting their forces (going around the clifts), and also, the twist may surprise you because you are expecting units on the top side but no :P.
At the end it's chaotic. 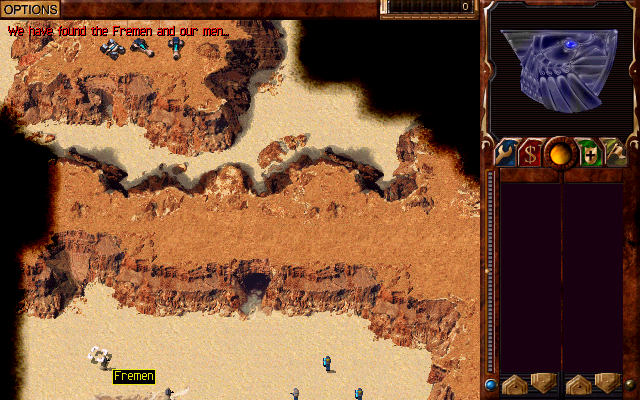 Fremen going against Ordos (or you) and the smugglers builds faster than the Ordos. Carryalls are your friends, my friend. You encountering problems Im not. Probably because you play so fast. To me by the time I have every building and I have ready a first initial attack group ready all the enemy reinforcements no longer appear (but you are so fast that enemy still recieve stuff :P). 1: giving a reason to build carryals. 2: placing the harversters in danger not to near, so the player have to move a bit to do the job. Also, smugglers in my run sometimes recieve attacks from the tradicional attacks, sometimes even the Imperial (maybe I am more closer to my initial area). Also Harkonnen are defensive because I didn't want to make the player the one stomping the enemy, but the Imperials. 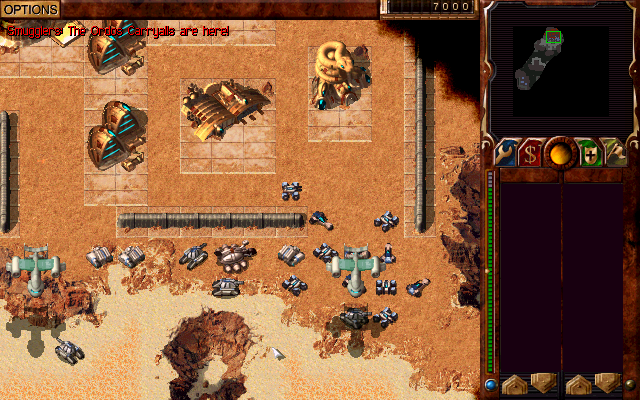 You only break the defenses and then the Emperor destroy them from the inside (once you take any building out the Emperor win the map for you); there is also a couple of ways to lure the enemy outside the base, making killing the defensive units more easy outside the turrets (plus it's narrow, Harkonnen have trouble going to the outsde too) then a few troopers here and there to take the turrets and the rest go smoothly. Probably they grouped or something, I don't know. The reinforcement are fast and stuff, but maybe they went against other or you units/harverster/something and the new reinforcement land, so they become big. Otherwise, that ambush demands pre-knowledge, and that's quite unfair. Well, I still have a trauma because you did the same to me, like those 22 imperial units dropping out of nowhere after I finish the job. There it's also other of you maps with a change of alliances with an ally very near to you (that become enemy). If you don't have any stuff in the entrance (with an ally in front of me defending I have no reason to have too many units or turrets there) you may get destroyed too, so a bit of pre-knowledge it's required too. Overall everytime this type of idea i'ts used requires some kind of pre-knowledge, one way or another. Even Red alert 2 "destroy the Kremlin" need it. Build the Nuclear missile withouth lots of anti air units and you are doom. Anyway, I'll try to check a bit about this. Maybe dropping some less tanks or something like that. Well, Ordos recieve 1 combat tank (2 sieges and trikes if you want to count them as "threat" every 10 minutes, and extra quads-tanks every 15 minutes. Your ally recieves more units in less time (every 8 minutes, and so they buy stuff too). It's just that the Ordos wait a lot before the first attack, that would make them group a lot, and when the Harkonnen attacks also may make them groupen even more. Mercenary are to take out first (taking out heavy fact or starport and they are useless, they are set to attack at intervals they recieve a delivery, so attacking them after you have been attacked by then it's the best moment), from there Harkonnen + Atreides double attacks should do fine against the Ordos. Also keep in mind that the Ordos recieves trikes, not raiders. So he still uses some time to build raiders to match the proportions. Overall I wanted to make the player to build the first refineries in the near position, having quick incoming, but then needing to deploy carryalls in order to move to a safe/far area. To me this is a hard map, the enemy attacking everytime and your ally it's random too, but I think it's a fun map :P.
For some reason, I didn't expect the Harkonnen to turn on me this map, but I'm glad they didn't. They have a heart, you know, they aren't that evils xD. But... but... xD. I'll check that. There are like several maps with 2 vs 4, 3 vs 5, 3 vs 4....... (mostly old campaigns). I wanted to do the same but with the "only one path to go". Making something different. Since the Fremen don't have tanks or sonic tanks I wanted to make the fremen (unit) the real threat. Need to point that with troopers on the east area you can take Fremen buildings (Sometimes the Tleilaxu take a building or two too). Curious fact, aarmaaggeeddoon took 20 minutes playing on hard. That's a big difference. (although he may played twice, but still, take me like 1:15 to beat the whole map. Lemme know if my suggestions wind up being helpful. Of course. I think overall the main problem it's you play really fast. I need 30 minutes (random number) to set my whole base, so by that time all the enemy reinforcements are gone and noone it's pushing me back. However you at 7 minutes are already about to attack the enemy and having trouble for that. More Refineries on MAP03. I guess that's fine. I'd like it if it were a liiiittle easier to get started! Oh yeah, after I got my economy started on MAP04 it went really smoothly. I just wish I could have started pumping out more units quicker! I had to focus on building Refineries, Carryalls AND Harvesters. Maybe if one field were closer to the Atreides base, even a small one without a bloom, it'd help get started quicker! Ohhh. ANY building? Haha. And there I went around the side for nothin' when I could have blown up one of those turrets in the front of the base! I saw a poor angle of attack there and thought "Okay no, I reeeeally need to go around the side." So, I ended up in a LOT of brawls with Harkonnen units before I took that Factory and Repair Pad and put up those turrets, and then I was already blowing up their base when the Imperials came in from the south like "hi we're here to kill you both" and I was like "ah crud." That's probably why this map took so long. Perhaps you could add a condition for the Imperials to show up resulting from the Harkonnen suffering enough casualties? Yeah, the reinforcements were startling but when are they meant to end? Considering I only saw two drops the second time around, and the first time was literally S2V1-tier pwnage... XD I'd love to hear more about the parts of my campaign that happened too suddenly, too. I don't like pre-knowledge anywhere, so that's something I want to fix! And hey, that S2V1 one was the end of the map! One is not meant to survive that. Ohh, that might do it. My first attack came well before the Ordos came at me, and the first time attempting this one resulted in one dead Mercenary base and two dead Atreides bases because of all the Ordos suddenly. Maybe if you gave the Ordos reinforcements nearer their first attack, rather than available from the start? Or something. The Harkonnen weren't all that helpful either; they were totally out of the way of my base, so they didn't eat any fire. Aye, that worked out really well on MAP07 and I think that's how MAP04 could start as well. The problem was with what came after those Spice fields were clear! All the Harvesters moving down south, into enemy territory. MAP07 wasn't all that difficult, but it was fun! The Fremen Refineries are notably in range of Siege Tanks and Missile Tanks from the sand, so I took advantage of that. Well yeah, but hey, they hate the Atreides! You'd think they'd turn at some point XD But I guess that's why this campaign is called Heretic Alliances! That's pretty interesting, and sounds about right if you know where to go and what to do. I was throwing units en masse at that one choke point until I took it with an MCV, not with so many forces at once that I took it the very first time, and I'm not sure if the game time counts if you have the program minimized, but I kinda had to AFK for a few mins during MAP09, so. Maybe that added on? 25 or so minutes then. I didn't bring any infantry up to attack the Fremen or Ordos either. Aye, an aggressive playstyle is what I like to do. Your use of reinforcements is often great, occasionally you balance things out with reinforcements for the player as well or something, but sometimes my quick attacks and your reinforcements collide with poor timing. I should also mention that I really like your map structure and base layouts in general. I realize my bases tend to be kind of cluttered, and that's something I'd like to adjust. If you still plan on checking out the rest of the updates to the smugglers campaign or the new Harkonnen maps, I'd love some comments on how I can change the layouts here or there. I'm actually playing through the Harkonnen Family campaign at the moment, so I'll be able to give you some feedback on that as well. Any building that it's not a turret or ref. It's just a "building doesn't exist". The reason I make the "take building" it's because your camera it's going to be (presumably) in the Harkonnen area (because you are still attacking, maybe with only a few units alive, but still moving foward) and you can see not only a text on screen but the area revealed near your position. I don't like pre-knowledge anywhere, so that's something I want to fix! And hey, that S2V1 one was the end of the map! One is not meant to survive that. I mean the Imperial drop after capturing 1 outpost I think it was (I forgot what map was). I know. Pre-knowledge type of map it's a bit problematic, but at least it's a first time surprise. I remember a couple of maps for other people doing something like this (a dangerous change of alliances, drops at X, etc). Indeed. Emperor and Fremen together, Atreides and Harkonnen together, all of them are a bunch of heretic xD. Also I already make the Fremen to turn on you... ¡Twice! I think it's enough xD. I didn't bring any infantry up to attack the Fremen or Ordos either. In a couple of my first runs I didn't, but later I just tried doing it and found that using troopers (groups of 10 or so) can be succesfull. Negating the deliveries from the starport (and a Palace, for example) and eventually you can make the Fremen to loose most of their production, even before defeating the Ordos. By the way, out of curiosity. What colour the Tleilaxu wear? I miss when I played with windows XP. Tleilaxu were green-muddy, but now they are like blue-black or something like that. If you still plan on checking out the rest of the updates to the smugglers campaign or the new Harkonnen maps, I'd love some comments on how I can change the layouts here or there. 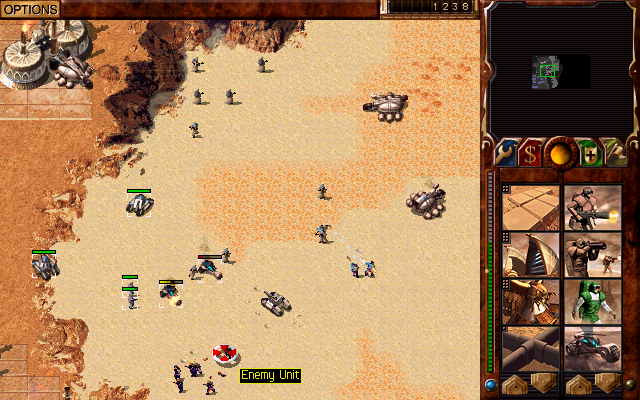 I am playing today C&C Tiberian sun, but eventually I am going to return to Dune 2000 and replay some campaigns (I'll start with yours). I experimented just a little with the defence area there, not too much. Ohh, I see. I still think some of the walls narrowing that main passage into their base could be removed! The cliff narrows the pathway enough. Right, that's a good idea. And it means you need to spend some time trying to make that attack happen! Aye. I try to keep things as fair as I can, provide hints and stuff, but overtuning / undertuning can still happen. That's what a second opinion is for! Yeah. I think the second time around on level 5 is more fun, that map is fun in general. Right. I had no idea if the Fremen so much as had a ConYard or where their structures were, so I used my Troopers to power through the turrets on the west side of the map. They wore a bright green and showed up as pink on the minimap, always. I love TibSun. I look forward to your feedback, man. Aye. It's looking good so far, but I'll give you all the details when I'm done!